This article was published in the Athens Messenger on December 8, 2010. Thanks to two local organizations, 60 Trimble Middle School students traveled to an area organic farm, where they tasted new foods, learned about growing organic vegetables and had some fun encounters with farm animals. The field trip was one of a series of activities sponsored by Rural Action and Community Food Initiatives (CFI). Joe Brehm, environmental education coordinator for Rural Action, and Molly Jo Stanley, Edible Schoolyard coordinator with Community Food Initiatives, planned the trip as one of the activities they sponsor with Trimble Local School students. 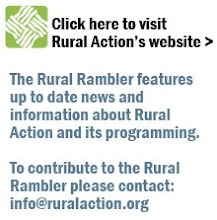 Rural Action is a nonprofit organization that aims to foster social, economic and environmental justice in Appalachian Ohio. 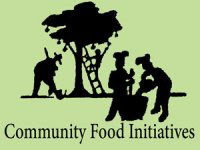 CFI is an Athens-based nonprofit that works to increase food security. In the spring and summer, Brehm and Stanley helped Trimble students create raised vegetable gardens, and, after the fall harvest was over, they helped the students get the beds ready for winter. Recently, as an extension of this project, Brehm and Stanley contacted Mellisa Bailes, middle school activities coordinator, about taking a group of students to Starline Organics farm near Athens. Bailes selected 60 fifth-, sixth-, seventh- and eighth-graders who traveled to the farm in two groups. Brehm said the ultimate goal of activities like the trip to Starline Organics is to give area children knowlege of farming and healthy eating as a way of life. While at the farm, students sampled homemade puffed spelt, an all-natural product that tastes much like heavily processed, sweetened cereal. The product, which the farm sells at the Athens Farmers Market, has no additives or preservatives. It is made using only spelt, honey and coconut oil. Bailes said many students tried it for the first time and said they liked it much better than commercial pre-sweetened cereals. Students also were served butternut squash soup made with organic vegetables grown on the farm. While some students didn’t like it, many did. “When we got back, 15 kids asked me for the recipe,” Bailes said. On Tuesday, several students talked about their day on the farm. “I liked the animals. The goats were funny,” said Robert Scott, 13. “It was cool. I liked the animals,” said Brandon Hammon, 11. When asked if he worked on the raised gardens at the school, Brandon said he did and enjoyed it. “We put seeds in the garden and then waited for them to grow,” he said. Katie Riley, 12, said she, too, liked working in the garden. She said the school garden and the trip to Starline Organics gave her the chance to sample new foods.